One day a few months ago I was working at the card catalog and I overheard a conversation between a group of young men and the reference librarian. It was clear that these young men were visitors to our library and they were asking where certain items were found. It happens that they were students at another West Bank University and came to our library in order to find the information needed for their research. Another day soon after another group was repeating the same scenario. They came not because there is no library at their university but because they can find here what they need to find. Visitors come frequently to research on a wide variety of topics. Despite the difficulties, problems, and limitations that we experience we continue to offer opportunities for the serious learner to improve and advance through education. In a recent study conducted in one of the courses on campus results indicated that some of our students are unaware that there is a center for Palestinian heritage located in the library. The center, called Turathuna, is found on the first floor. Everyone is welcomed to visit and to take advantage of the important resources available here and in all the different areas of the library. 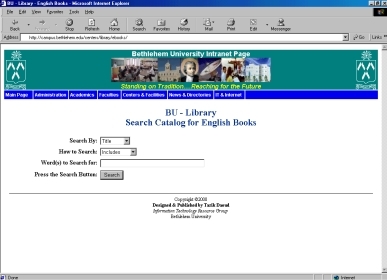 ق Search the catalog for books in English online. ق Monthly lists of new books received in the library. ق EBSCO Publishing – access to database search of full text of scholarly publications for all academic areas of study. ق EBSCO Online - access to full text of all online journal subscriptions. Turathuna: Center for Palestinian Heritage at Bethlehem University opened at the beginning of the academic year. The center, funded by a grant from Ireland Aid, aims to contribute to building a positive Palestinian identity, through increased familiarity, with and pride in, national heritage. Students and visiting researchers have used the Palestiniana Collection extensively in doing research and preparing course assignments. The committee has worked in planning and preparing displays for the center. Numerous items have been donated for the exhibit areas. Examples of glass, pottery, olive wood, mother of pearl, carpet, dress, embroidery and many other artifacts that reflect local heritage and culture are on display. Three donors, in particular, have made very generous contributions of a variety of items. Egyptian Arab Land Bank financed the purchase of the artistic Palestinian pottery for the wall panel under the large window and the handmade Bedouin carpet mounted on the wall. Mrs. Elizabeth Moley from Saratoga, California had donated many items used in the home, such as a grinder for coffee or grain and a brush for taking care of the wool of sheep. In addition, she gave different pieces of clothing for women, such as a headdress and a face veil. Curator of Turathuna. 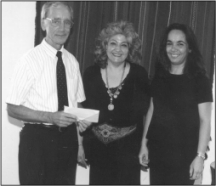 Mrs. Maha Saca has made a large contribution for her father. She contributed many books and a table and chairs in order to create a special corner dedicated to his memory. Also, she gave clay products used in preparation of food and handmade straw products used to serve food. Many other items that reflect the Palestinian culture have also been received. Special arrangements can be made for items to be loaned to the center for a limited time. A complete list of the donors can be seen in the center. Our sincere appreciation goes to all who have donated. The list of donors to the library continues to expand. During the past year four specific projects have added a large number of new books to the library collection. The Institute of Conflict Resolution at George Mason University in Fairfax, Virginia, supported by USAID has provided the library with a collection of books on conflict management and related topics. The project was coordinated by Dr. Vivian Khamis of the Department of Social Sciences. Dr. Henry Jaqaman, Dean of the Faculty of Science, has obtained a collection of books in various topics in Physics through a grant from DFG, German Research Foundation. The Tantur Ecumenical Institute has donated a collection of books on Scripture, History of the early Church, Judaism, holy women and other religious subject. International Accounting Standards Committee, supported by USAID, is providing educational materials in management, accounting, auditing, finance and similar topics. The project was coordinated by Mr. Fadi Kattan, Chairman of the Department of Accounting. Mrs. Naomi Nobel, Director of the British School of Archaeology, presents the two volume set ''Ottoman Jerusalem'' to Br. Dominic Smith. At different times during the year the library gave away old and used books. The storage areas on the second and third floors were cleared and these books were sold for a contribution to our student assistant scholarship fund. Staff members took advantage to profit from a variety of different professional activities throughout the year. Mr. George Awwad attended a weeklong workshop at Bir Zeit University in ''Cataloging and classification''. Ms. Gloria Handal attended the course ''Quality Office Service'' conducted by Dr. Usama Shahwan and organized by the office of Personnel Management. Mr. George Maria participated in the workshop ''Grant Proposal Writing'' facilitated by Br. Kenneth Cardwell and arranged by the Office of Personnel Management. He followed the Media course offered by a specialized Committee from Finland. The course was held in cooperation between Diakonia Polytechnic and Bethlehem University. He assisted at a presentation offered by the British Council entitled ''The Provision of Information Support to Distance Learners''. He was also involved with the special course in designing and producing multimedia software. And finally he attended the training computer course entitled ''Microsoft Access'' conducted by the Institute for Community Partnership and taught by Mr. Tarik Daoud. Ms. Hala Marzouka participated in a four-day workshop organized by the British Council in cooperation with Al Quds Open University in ''Promoting and Marketing Services''. Ms. Mary Morcos attended a training course entitled ''Conducting Effective Meetings'' arranged by the Institute of Community Partnership and taught by Dr. Jeanne Kattan. Ms. Manal Musleh has completed two English Language courses at Bethlehem Bible College. Mr. Francis Sleibi enrolled in a course entitled ''Professional Graphic Design'' offered by Target Human Resource Development Ltd. in Ramallah. Washington, DC. The Bureau of Educational and Cultural Affairs at the United States Department of State has selected Francis to participate in the Multi-Regional International Visitor program entitled ''Libraries and Information Management''. The three-week program gave an opportunity to meet American library and information specialists and to exchange views on the latest developments. Visits to libraries in Washington, D.C.; New York City; Columbus, Ohio; Iowa City, Iowa; Los Angeles and the annual American Library Association Conference in San Francisco were on the agenda.